Lawrence, D.R., Brown, R., McPhee, E. & Slaughter, E.
Manas, L., David, B. & Quinnell, M.C. Much professional archaeological research around the world aims at aspects of history that are of international rather than of local significance, and text-based historical research has long been complicit in nation-building agendas. This paper introduces the present monograph by outlining why and how the authors of this volume have come to write a local history, with local issues in mind. 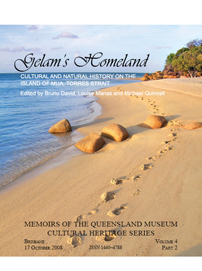 It is the first professional and multi-disciplinary history to be written in book form for any single island in Torres Strait, with community history in mind. Manas, J., David, B., Ash, J., Manas, L. & Shnukal, A.
David, B. & Barham, A.J. David, B. & Ash, J.
Ash, J. & David, B.
Ash, J., Brooks, A., David, B. & McNiven, I.J. David, B., McNiven, I.J. & Weisler, M.
McNiven, I.J. & Von Gnielinski, F.E. David, B., Orr, M. & Zoppi, U.